I was in a conference the first time I heard someone say it: "there's a 0% chance a 60/40 portfolio will make 5% or more in the next decade." Pretty bold claim…but this advisor isn't the only one saying it. In fact, if you just google "60/40" you'll probably find many of my colleagues arguing for its demise (even one going as far to say yields will be low for next 20 years). If this prognosis is true, the majority of American's 401(k)s, pensions, and savings are at risk. If you are unfamiliar with the 60/40 portfolio, here is a quick catch up. At the most basic level, a 60/40 is a portfolio made up of 60% stocks and 40% bonds. As the stock and bond portions of the portfolio shift and grow, the portfolio is periodically brought back into "balance." For example, if the stock market is growing, a portfolio that started as 60/40 may have morphed into a 70/30 (where the stock portion grew to 70%). 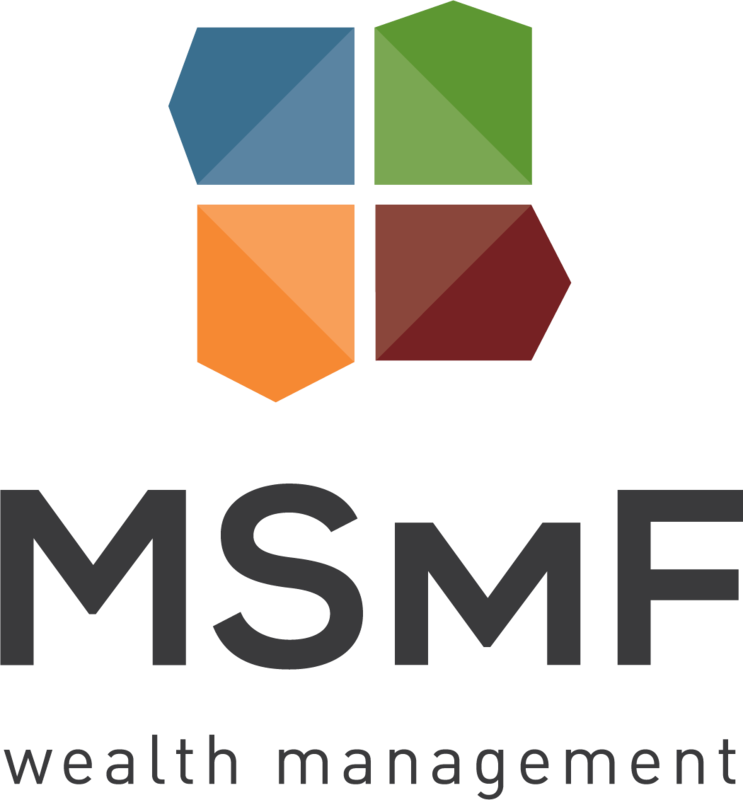 The account manager will then shift 10% of the stock portion over to bonds. The basic principal is when the market is growing, take the gains and shift them to more conservative and stable securities (i.e. bonds), and when the stock market is underperforming, take funds from the bond allocation and buy stocks at a discount. Simply put, the 60/40 is a disciplined method that forces an investor to buy low and sell high. If the “60/40” is Dead, Who Killed It? The current recovery has been a long slow climb with GDP growth averaging around 2%. In the past, however, investors have been used to strong recoveries with higher market gains. (Historically, GDP growth has averaged 3% during periods of economic expansion.) Slower GDP growth is not all bad though. When GDP begins to grow too fast, inflation kicks in and can create an overheated economy. This new, slower growth we are seeing may be attributable to a more mature economy. Long slow growth may be the new norm, but we shouldn’t fear it. The fact remains that our current recovery is a true outlier. When past expansions are graphed on top of each other, it is easy to spot today’s trend line. 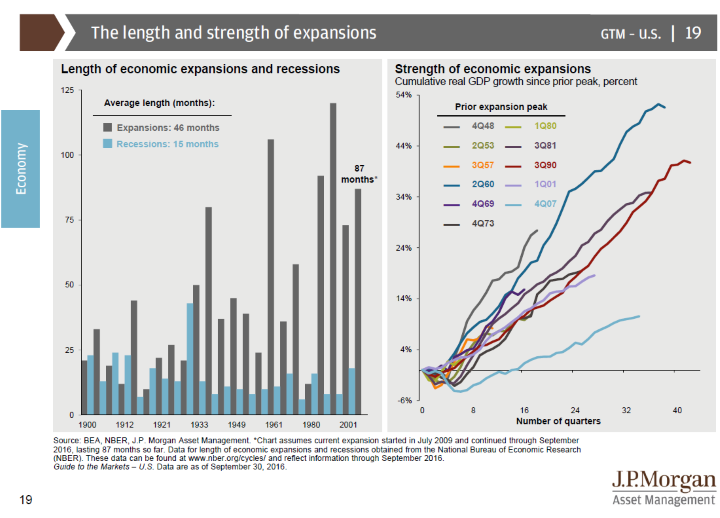 (See graph from J.P. Morgan’s Guide to the Market) Right now, there is just not enough data on slow expansions to make any bold claims that our new economy has ruined decades of proven investment philosophies. Do the math, as of writing this blog the current inflation rate in the US is 1.64% and the current yield on a US 10 year note is 2.38%. From a global perspective, it looks even worse with 70% of government bonds being below 1% and 33% of governments having negative yield. So, it’s true that the bond side of a portfolio has and will continue to be a drag. But, part of sticking to a plan is maintaining discipline through hard times. Lower government bond yields have pushed investors to seek better returns through lower quality high yield bonds. These outlets have helped investors increase their yield, but they have a price. High yield bonds have a higher correlation to stocks. While getting a better yield is great, a higher correlation somewhat undermines the philosophy of the 60/40 portfolio. A successful 60/40 will have low correlations between the stock and bond sides of the portfolio. Low correlations give an investor safety during market downturns. If both sides of the portfolio are moving in the same direction, there is less downside protection and it is harder to take advantage of low stock prices. In the short term, we may not see returns like we have in the past. However, there is no way we can say the 60/40 is no longer a viable option for the next 20, 10, or even 5 years. The truth is we are in an unprecedented recovery. Still, there are some things we can do in the meantime to help our portfolios through this time. Diversification is key to building a successful portfolio. Investors should consider looking into alternative investments that produce potentially higher yields while not having strong correlations to the market. With rates being so low, the expectation is that we will soon be in a rising rate environment. Keeping your bond duration (time to maturity) low can help an investor take advantage of these rising rates. Discipline is what sets great investors apart from good ones. Often investors end up cutting their returns because they jumped in and out of positions with no clear plan. If you have an investment plan, stick to it. If you don’t, find a partner who can help create a plan tailored for you. If you would like to speak with one of our advisors, to help form a plan or to review your current plan, send us an email using the form to the right*. *A diversified portfolio does not assure a profit or protect against loss in a declining market.